The editorial board of Estudios Irlandeses – the scholarly journal of the Spanish Association for Irish Studies (AEDEI) – is pleased to announce its Call For Papers for issue 14, to be published in March 2019. We cordially invite submissions of original manuscripts dealing with any aspect of Irish Studies. We publish high quality research papers that engage in a critical and original way with aspects of Irish literature and society, history, arts and the media. 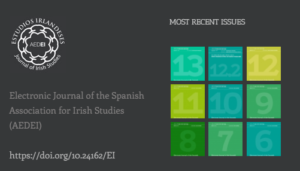 Estudios Irlandeses invites authors to submit contributions in either English or Spanish. Articles are subject to double-blind peer-review. Please send a 200 word abstract, followed by a list of 5 keywords, and a cover letter. Recommended length for essays is 5000-7000 words. Submissions should be sent via email to contributions@estudiosirlandeses.org not later than November 1st 2018.